Summary: Ed Wilson, Microsoft Scripting Guy, talks about replacing one Windows PowerShell function with a different one. I am often asked if I run out of ideas, and the answer is, "No, I don’t." There is so much I can do with Windows PowerShell that, in fact, a new version of Windows PowerShell will be out before I ever run out of ideas of what to do with the last version. No, the problem is not that I run out of ideas, but it is that I often forget what I have written. In fact, this week is a case in point. There is absolutely nothing in the world wrong with it. It works fine (that is, if I don’t start Windows PowerShell twice in the same second, which on my laptop is virtually impossible to do). It is obvious, that the code is essentially the same, but it has the added advantage that I can use it for any string, not just for the date. So, I decided that I want to add this function to my Windows PowerShell profile and cleanup the Windows PowerShell transcript name function a bit. But how? How do I bring in this function and cleanup the other function, when the Get-TranscriptName function has the functionality embedded into a rather complex line of Windows PowerShell code? I open a new tab in the Windows PowerShell ISE, and I test it out. 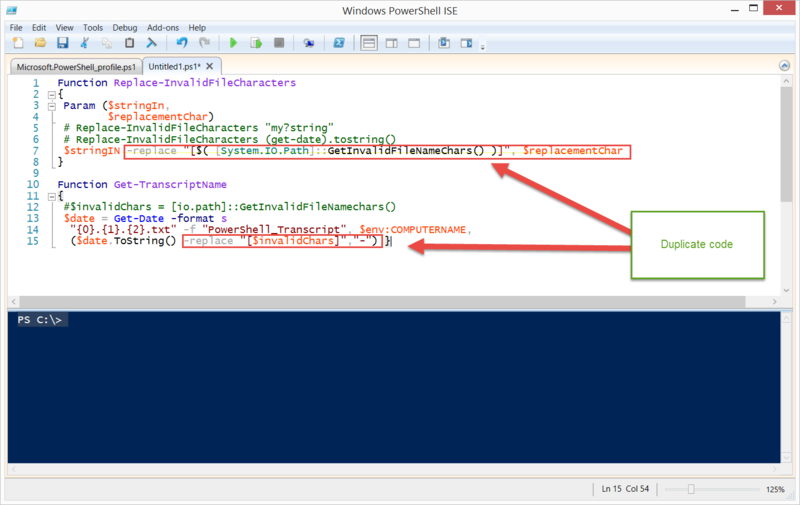 First I open my Windows PowerShell profile from the Windows PowerShell console by using my function Edit-Profile Windows PowerShell. Because the Replace-InvalidFileCharacters function performs the same thing as the code highlighted in the Get-TranscriptName, I can substitute the code in the Get-TranscriptName function with a call to the Replace-InvalidFileCharacters function. I need to first load the Replace-InvalidFileCharacters function into memory in my Windows PowerShell ISE so I can test it to make sure everything works properly. Get-Alias : This command cannot find a matching alias because an alias with the name 'rifc' does not exist. New-Variable -Name doc -Value "$home\documents"
On Monday, I'll wrap up Profile Week, and I'll be talking about adding variable descriptions to my profile. I invite you to follow me on Twitter and Facebook. If you have any questions, send email to me at scripter@microsoft.com, or post your questions on the Official Scripting Guys Forum. See you tomorrow. Until then, peace.